The powerful, new OZ Radial 400B by ScentLok is a versatile, portable ozone generator that helps fool a whitetail’s nose. “It smells like rain.” You’ve heard the statement before; you might have said it yourself. Fact is, the observation is real, and the chemistry behind it is equally real. The air smells clean before and after a thunderstorm because lightning and other electrical charges in the atmosphere split nitrogen and oxygen molecules into individual atoms, some of which recombine to form O3, or ozone, giving the air a sharp, fresh aroma. Okay, so maybe you already know that. But do you know that ozone can actually destroy other odors? Again, chemistry — and the specific process known as “oxidation” is responsible. The O3 molecule is inherently unstable; the third oxygen atom has a tendency to break its relatively weak bond and attach to other nearby molecules at any opportunity, forming new compounds in the process. When a molecule with a distinct odor receives an additional oxygen atom through oxidation, it is changed to something new that no longer possesses the recognizable odor. That’s why ozone is such a powerful odor destroyer, and why ozone generators are quickly becoming must-have tools for hunters and anyone else who wants to quickly and effectively deodorize gear and spaces. ScentLok offers a complete line of OZ Active Odor Destroyers using powerful, proprietary ozone-generating technology, and the company’s new OZ Radial 400B is one of the most versatile portable ozone generators on the market today. 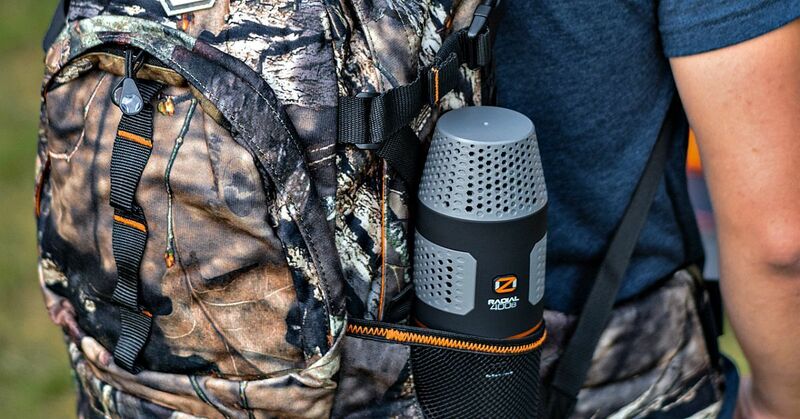 Ideal for hunters, campers, vehicle interiors and in-home use, the new OZ Radial 400B employs a unique, cylindrical design that attacks odors with an industry-leading 360-degrees of ozone output. Its one-of-a-kind bottle shape is deliberate, allowing the unit to be placed in a backpack bottle holder, vehicle cup holder, or on any level surface. For additional utility, the quiet, streamlined Radial is easily hung with its provided tether strap — no bulky and noisy brackets required. The OZ Radial 400B operates with four modes: Regular Output, Regular Cycle Mode, Boosted Output and Boost Cycle Mode. Both “Cycle” modes feature ScentLok CycleClean technology, which runs the product for 30 minutes and rests it for 30-minute intervals. This continues for 180 minutes, before the unit shuts off to preserve battery life. In addition, Boosted Output mode doubles the ozone output for enhanced odor-destroying capability. A convenient two-button design operates the various modes, while four LEDs clearly show the selected operating mode and battery life. The OZ Radial Power Bank has some of the longest battery life available, providing up to 8 hours of operation per charge. The Power Bank has two USB ports, one for recharging the unit itself, and one that can be used for recharging portable devices such as phones and tablets. The Power Bank doesn’t need any charging cradle; simply plug it in using the provided USB charging cable and wall plug. Additional batteries can be purchased for $99.99, which according to Andrews is about $30 less than the batteries of competing products. Nexus Outdoors, headquartered in Muskegon, Michigan, is a leading worldwide designer, marketer and distributor of odor-controlling apparel, footwear and equipment under the ScentLok, OZ, ScentBlocker, Scent Shield, Whitewater Outdoors and Tree Spider brands. ScentLok is a pioneer in the hunting industry, which many credit with creating a market based on the elimination of odors to get closer to big game.